Plant form, or shape, is one of the key principles of landscaping design. If you are looking to plant a tree, you must consider the shape of both the space and the tree. Different tree forms work differently depending on the shape and size of a space. Trees with a columnar shape are very upright and thin. They work well to fill in a narrow space, add height to an area, as well as in a row acting as a sort of wall. This creates space beneath the canopy of leaves. With this added height people can easily walk under which makes it ideal for lining and shading a walkway. A vase shaped tree also works well in a garden with plants that do not need much sunlight. The branches of a weeping-shaped tree droop downward and are helpful in leading the eyes to the ground. Just the littlest of details beneath a weeping plant can become a focal point. This is your typical Christmas tree shape. Opposite of weeping, pyramidal forms direct the eyes upwards. Since it is wide at the bottom they are particularly helpful in shielding any unappealing focal points low toward the ground. Keep in mind that these trees will need space to reach their full width. This form is usually more common in plants than trees. The roundness creates a narrow low point and leads the plants to group around it. Got your tree picked out? The next step is to have it planted correctly professionals. A properly planted tree or shrub will be more tolerant of adverse conditions and require less management than one planted incorrectly. At Landscaping Unlimited we ensure each plant, shrub or tree is specifically appropriate to the site, or the site will be amended to fit the plant and ensure a healthy landscape. 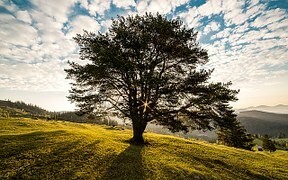 Still not sure what the best tree shape is for your yard? Contact Landscaping Unlimited for a professional opinion. We are committed to bringing you the newest and latest trendsetting plants and trees and are well versed in the greenery zoned for Southern Connecticut.